I like this product. It is easy to apply and does not leave greasy film on hair. Smells very gently and make my hair nice, soft and easy to comb. I have used the solid conditioner for a week now. I always wash my hair everyday and it took about 4/5 washes for my hair to adjust. I use the conditioner only on the ends a leave for a couple of minutes. Took me a couple of uses to get the hang of it, but my hair is so nice now. Smells fantastic, doesn’t lather up much but I found that rubbing it on my hair as the shower was running helped. Leaves my hair soft. I am still getting used to using a conditioner bar, so it’s difficult to rate as my only comparison is liquid conditioner. My hair does not feel as soft but that was of course expected, it smells lovely, and I think it willlast a long time. My hair is getting used to it and every wash has been better and better. I have only been using this for a few weeks and it is the first time I have used bar shampoo and conditioner. I have been happy with it so far, call smell the shea butter. It leaves my hair nice and soft, but unfortunately the nice smell of the soap does not linger on my hair after washing it. So far I'm finding this solid conditioner really useful in transitioning to more natural haircare products, it leaves my hair soft without getting greasy or weighing it down! I really love this, it leaves my hair feeling smooth and I don't get greasy as quickly as I did with standard shampoo/conditioner. Great conditioner but didn’t seem to cope with our long hair to well. Gift for my grand daughter, I haven't heard any complaints. You only the tiniest amount so a little bar will last months and months. Easy to use. Very efficient service from the company. All products came nicely wrapped and perfect for Xmas pressies. Great products no plastic packaging, great service. Happy with purchase. Smells gorgeous, packaged nicely ... My transition to being plastic and chemical free has been a pleaanty introdcution with this product. Great that the shampoos and conditioning bars can also be used on the body ! (I did not check if these were animal ethical - I am hoping so) Have not been using product long enough to give a totally honest review - but I am confident that they will still be great after a period of use ! This product is brilliant first time using but I use the shampoo bars all the time. Conditioner bar really compliments the shampoo bar, highly recommended. This conditioner makes my hair really soft and shiny. It doesn't feel like you've got much on your hair until you start to rinse. This is my second bar of this. Bit hard to apply but it does leave my hair silky and lasts for ages! Leaves my hair feeling great. Having tried a couple of other bar conditioners which unfortunately contained SLS's, I was keen to try this one from Funky Soap. I have shoulder length wavy / curly hair which is quite thick and I have to say this conditioner has been brilliant for it. Yes, getting used to bars instead of bottle takes a little bit of time but I have no regrets and my soft, manageable hair isn't too wild. Would highly recommend it and order it again. Absolutely gorgeous conditioner, no strong perfume, keeps my hair frizz free and soft. I was sceptical at first, but after trying this conditioner I’m hooked! With a gentle smell, it leaves my hair feeling soft and smooth. It lasts ages too ! Why would I ever go back to synthetic stuff packed in plastic ? . Smells good, conditions without weighing down hair and lasts ages. 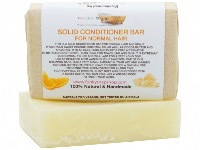 I like this conditioner bar, it detangles my hair well but doesn't coat it with loads of product. I would recommend. I love the solid conditioner bar; it is harder to coat the hair than with my usual liquid conditioner (I have quite long hair), but after rinsing it feels soft & shiny. No unnecessary plastic packaging. Love these conditioner bars. Wouldn’t get then from anywhere else. Easy to use and great fragrance and lasts for a long time. Great products all round. Works every bit as good as bottled conditioner.